FIFA World Cup is the most popular tournament in the world, followed by billions of people on Television. I wanted to take some time and make this web page dedicated to World Cup Soccer Facts for kids and anyone else wanting to know more about the greatest tournament held every 4 years. There are many facts about the World Cup, and below you will find the most interesting World Cup facts. World Cup Soccer Facts start with the beginning roots of this tournament. 1. First FIFA World Cup was held in Uruguay, back in 1930. This World Cup was played from July 13th - 30th with 13 countries participating in the very first World Cup tournament. 2. 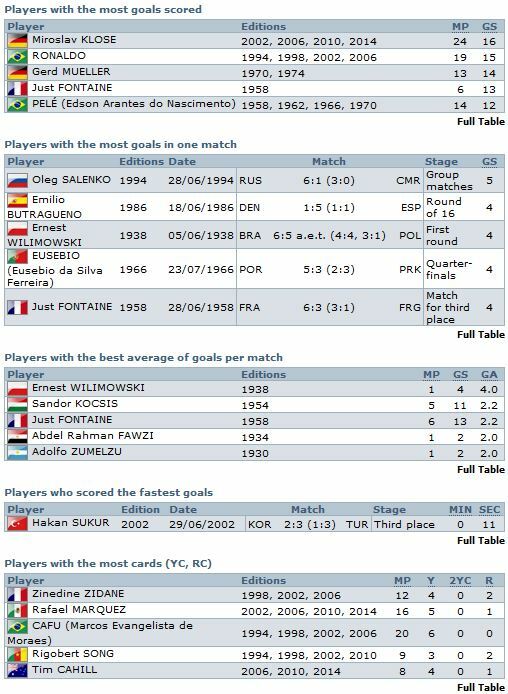 Brazilian, Ronaldo Luís Nazário de Lima held the record for most World Cup goals scored, until the 2014 World Cup. Ronaldos 15 goal record was overtaken by German, Miroslav Klose, in 2014 World Cup. Klose scored his 16th goal, breaking Ronaldo's record and making himself the top goalscorer in World Cup history. 3. The oldest player to lead a Country to the World Cup title was the Italian goalkeeper, and captain Dino Zoff. At the age of 40, Zoff captained Italy to their 1982 FIFA World Cup title. 4. 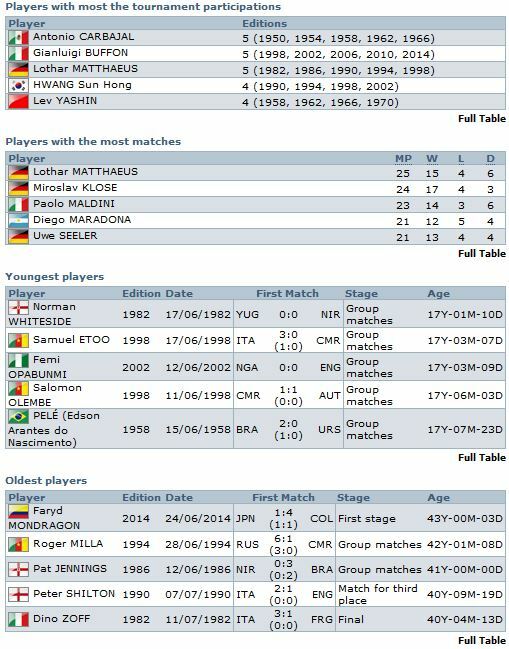 World Cup facts continue with the oldest player to participate in the World Cup tournament, and also score a goal during his last World Cup. Roger Milla, from Cameroon, was 42 years old when he played and scored during the 1994 FIFA World Cup. Faryd MONDRAGON, from Colombia, is now the oldest player to participate in world cup competition. He was 43 years old when he stepped on the pitch for Columbia in World Cup 2014. 5. German, Franz Beckenbauer, is the only player in the history of the World Cup to win the title as a player, and as a coach for Germany. In 1974, he led Germany to their title as a player, and than won the title again in 1990 as the Germany Coach. 6. First player to miss a penalty kick in World Cup competition was Valdemar de Brito of Brazil. 7. After winning their 2nd World Cup title in 1938, Italy went on a 44 year drought, before winning their third title in 1982. 8. Hungary holds the record for most goals scored in a World Cup match, when they beat El Salvador 10:1 during the 1982 World Cup. 9. Germany and Brazil hold the top spot for most appearances in the World Cup final. Both countries made it to the finals on 7 different occasions. 10. Best finish for USA in World Cup competition was 3th place, in 1930 World Cup. 11. Scotland made the World Cup qualifications 8 different times, and was eliminated on all 8 occasions during the first round of the tournament. 12. Brazilian striker Ronaldo was named MVP at the 1998 World Cup final against France, even though French came out of this game winners, and 1998 World Cup champions. 13. First goalkeeper to win the Most Valuable Player award was German Oliver Kahn, in 2002 FIFA World Cup. 14. Frenchman, Just Fontaine, holds the record for most World Cup goals scored during one competition. He managed to find the net 13 times during the 1958 World Cup. 15. Italy's Vittorio Pozzo is the only head coach to lead the nation to two consecutive World Cup titles as the head coach, in 1934 and 1938. 16. Germany has played in the most World Cup matches. 17. Brazil has scored most goals as a Nation in all World Cups. 18. Record number for most World Cup appearances is held by German soccer player Lothar Matthaus, with 25 appearances. 19. Fastest goal in World Cup history was scored by Turkey's Hakan Sukur, 11 seconds into the game against South Korea, during the 2002 World Cup. 20. One funny World Cup fact is India withdrawing from the competition in 1950, when they ware denied playing barefoot in the World Cup tournament. 21. Mexico holds the record for most defeats in World Cup history. 22. Very first hat trick was scored by an American, Bert Patenaude, during the 1930 World Cup. 23. Funny World Cup fact is FIFA prohibiting players from swapping shirts after the game in 1986, because they didn't want players to "bare their chests" on the field. 24. Sir Viv Richards is the only person to have played both World Cup Football and World Cup Cricket. 25. World Cup is played every 4 years. 26. Highest attendance at the World Cup was during the 1950 World Cup final between Brazil and Uruguay. It is reported that 199,854 people attended this final match, played at the famous Marakana stadium in Rio de Janerio. 27. Record for most World Cup titles is held by Brazil, winning the tournament 5 different times. 28. 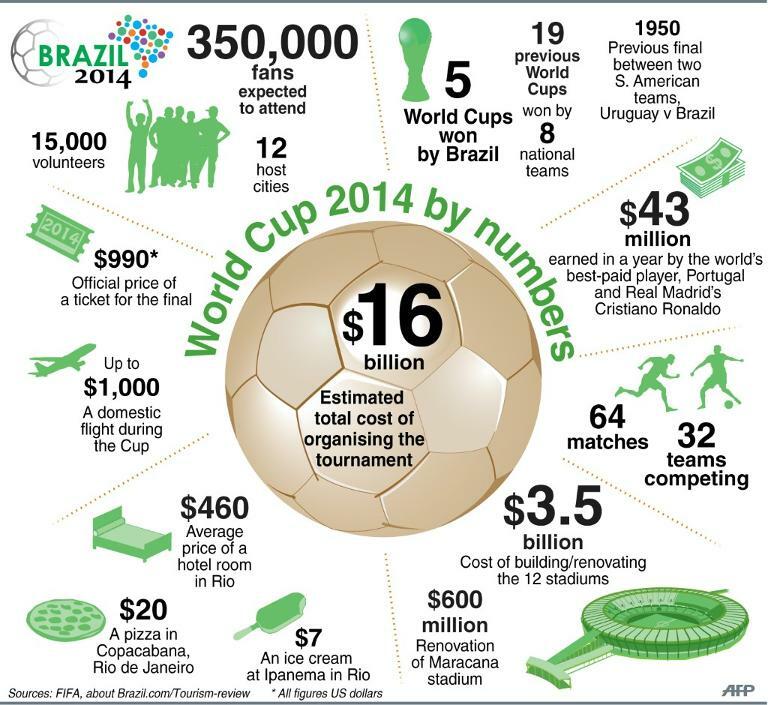 Interesting World Cup fact is out of 19 World Cups so far, 6 tournaments were won by the host Country. 29. Brazil is the only Country to have appeared in every World Cup tournament since 1930. 30. No host Country had ever been eliminated during the first round, until South Africa in 2010. 31. World Cup soccer facts continue by mentioning that World Cup is the most widely viewed sporting event in the world, with over billion people watching this competition every four years. 32. First World Cup was won by the host Uruguay, in 1930. 33. World Cup was not played in 1942 and 1946 because of World War II. 34. World Cup trophy, also known as Jules Rimet Trophy, is made out of solid 18 karat gold and weights more than 6 kilograms/13 pounds. 35. Netherlands, Czechoslovakia and Hungary are the most successful teams to have never won the tournament. They all made two finals, but never won the World Cup. 36. Pele is the most successful World Cup player, winning the title 3 different times with Brazil. 37. Argentina knocked out England during the 1986 World Cup. Courtesy of the goal scored by Diego Maradonna with his hand. This goal is referred as the "Hand of God" goal. 38. Two World Cup finals have been decided on penalties. Brazil beat Italy in 1994, and Italy beat France in 2006. 39. Zinedine Zidane, one of the greatest soccer players ever, is remembered for his last act on a soccer field during 2006 World Cup. He head butted Marco Materazzi in the chest, which led to a red card as well as a farewell to professional soccer. 40. The fastest red card in the World Cup history was Uruguay’s Jose Baptista. He lasted full 56 seconds on the field during the 1986 game against Scotland, before being sent off with a red card. These are some of the most interesting World Cup soccer facts that I could find. Some facts I found surprising more than others, and with the game constantly improving and new records setting, I am sure that some of these facts will be surpassed by other players, or countries, in the years to come. I hope you enjoyed reading and learning more about the greatest tournament held every 4 years in a different part of the world. For more world cup facts visit 100 Things You Should Know About the World Cup.